Buying new carpet is a big project to tackle. With all the information, products, and variables you need to know, it can seem a little daunting. If you have a guide to lead you through everything, that daunting task can be done in a breeze. In the next few weeks, The Carpet Geek will be breaking down our expansive Carpet Buying Guide in easy-to-digest videos. He’ll cover everything you need to know, from why you’re considering carpet in the first place all the way to proper care and maintenance post-installation. 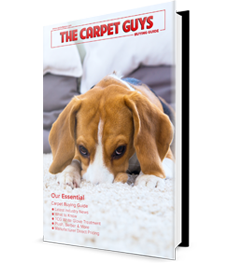 If you haven’t downloaded your FREE copy of the Carpet Buying Guide, you can get it below.